How’s this for a quick, easy and quite spectacular mid-week meal? 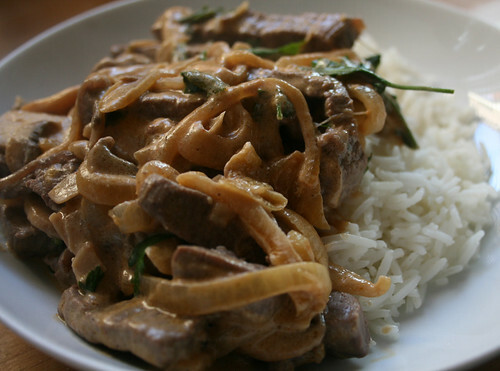 I’ve been dying to try beef stroganoff for ages and I wasn’t disappointed; I can see this becoming a regular in my kitchen. Not only is it very tasty, but it is so quick and just needs a little chopping, stirring and some boiling of rice. It would be a great way to feed a crowd when you’ve been at work all day and want something good, filling and effortless. I loosely followed this recipe, but my measurements were no more accurate than: a couple of fillet steaks, a good sprinkle of paprika then another sprinkle at the end, a small tub of sour cream, a handful of button mushrooms, an onion, a squeeze of lemon juice, salt and pepper and a little flat leafed parsley. I’d imagine this is a forgiving dish – just don’t overcook the steak, it only needs a quick flash fry over a high heat.